The Chicago Blackhawks have officially competed in three games in this new year. It didn’t start out all that great, with a loss at the Winter Classic on New Year’s Day. But the team improved as they went along, earning a point in overtime and then a win in the next two respective contests. The Hawks are playoff bound! Ok, let’s not get carried away. Because although it’s still statistically possible, we all know it’s not very probable. The Hawks are making strides in the right direction, but they’re just not good enough to start winning on a consistent basis. So instead let’s take each game and try to build on the positives. Because the team is actually slowly changing and evolving right before our very eyes. Let’s break down the first three games of 2019, and discuss some adjustments and updates along the way. The first game of the year for the entire league was on center stage at Notre Dame Stadium on New Year’s Day. The Blackhawks hosted another Original Six team, the Boston Bruins, for the 2019 Bridgestone Winter Classic. What a great chance to earn a big win in front of a national audience! Yeah well, not so fast. Does it really come as a surprise the Hawks lost this one? They’ve now been defeated in five of their six outdoor games. No other team in the league has participated in more outdoor contests. Enough already! The good news is NHL commissioner Gary Bettman said the Hawks won’t be part of any open-air shenanigans next year. The big boys couldn’t get it done on the big stage. Sure, Jonathan Toews earned a secondary assist. And his shot that hit the crossbar towards the end of the third could have been the equalizer. But it wasn’t. Patrick Kane failed to extend his seven-game point streak. I guess when you’ve done it so many times, the glamor and the glory tends to wear off. So did anyone else show up? Yes they did. If nothing else, Brendan Perlini can always say he scored the first ever NHL goal in 2019. He earned his third goal as a Blackhawk with the first tally of the day. Perlini’s been a bit of a disappointment since he came to the team from the Arizona Coyotes as part of the Nick Schmaltz trade. The Hawks hoped he could use his speed and tenacity to make an impact as part of the forward bottom-six. Instead, he didn’t break the scoresheet in his first nine games. In 17 contests, he’s only contributed three goals and one assist. Although the Winter Classic was arguably Perlini’s best game as a Blackhawk. In only 7:26 minutes of ice time, he scored a goal, recorded four shots, two hits, and one takeaway. Here’s hoping he can build on this strong performance. David Kampf should be mentioned as well. It was his takeaway behind the net and dish to center ice that made Perlini’s goal possible. He also had a nice breakaway attempt later in the game that was unfortunately thwarted by the practiced efforts of veteran Patrice Bergeron. Dominik Kahun scored the only other goal for the Blackhawks, making it his fifth of the season. But the Hawks lost the special teams battle, giving up two power play goals, and were unable to score on four of their own attempts on the man advantage. A third-period goal and empty-netter from the Bruins sealed the deal. There was some controversy when 14-year veteran Cam Ward was named the starting goaltender for this game. Collin Delia has been the better goaltender of late, and many thought he deserved the start. But Ward wasn’t the reason the Hawks lost. He put up a valiant effort, stopping 32-of-35 shots to give the Blackhawks a chance to stay in the game. The Blackhawks headed east from Notre Dame to take on the New York Islanders for the first time this season. Considering they recorded only 21 shots on goal to the Islanders’ 50, it’s a wonder the Blackhawks came out of this game with a point. They were killed in the faceoff dot as well, winning only 34% of their draws. Fortunately, Kahun came through with his second goal in as many games, and Kane got back on the scoresheet with a power-play goal. But once again, the other team came out on top in overtime. Delia returned to the net and picked up right where he left off with another strong (and busy) performance. He stopped 47-of-50 shots for a .940 save percentage. I think this young netminder might have taken some interview lessons from Corey Crawford. He has the same deadpan seriousness. Dylan Sikura spent the entire third period on the bench, so it was no surprise when he was re-assigned to the Rockford IceHogs over the weekend. Andreas Martinsen joined him after clearing waivers. This makes room for Drake Caggiula, who finally made team practice Saturday after resolving some Visa issues. Well, let’s start off with the biggest first; the Blackhawks won their first game in 2019. They’ve now won 10 straight games against Pittsburgh, and snapped the Penguins’ recent eight-game winning streak. Considering the Chicago Bears just lost a heart-breaking football playoff game earlier in the day, this was a much-needed salve for the wound in Chicago. Ex-Penguin Chris Kunitz was inserted back into the Blackhawks’ lineup after being a healthy scratch for 10 of the last 11 games. This was mostly because he was being honored along with other Penguins for their Stanley Cup win in 2009, 10 years ago. It was a classy move by the Blackhawks, and they even had him start the game alongside Toews and Brandon Saad. 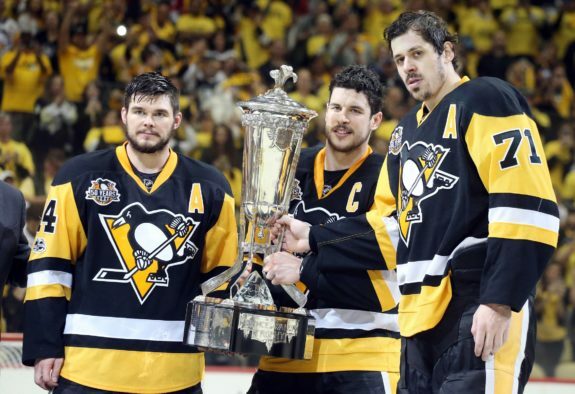 But Kunitz did more than simply make a symbolic veteran appearance. He scored his first goal as a Blackhawk to tie the game at 2-2 in the second period. Not only did Kunitz score his first, but Duncan Keith tallied his first goal of the season as well. Although Keith is third on the team in assists (17), he hasn’t scored a goal in the last 46 games. Considering Keith’s importance in the history of the Blackhawks and their last three Stanley Cups, I think this deserves a video. Drake Caggiula (No. 91) made his Blackhawks debut against the Penguins Sunday night. In 11:09 minutes of ice time, he recorded two shots on goal, three hits, and finished the night a +1. Not a bad start for the 24-year-old from Edmonton. Kane will represent the Blackhawks in the 2019 NHL All-Star Game on Jan. 26. This will be his eighth appearance, which is the most of any NHL player. Toews could be voted in as part of the Last Men In ballot. A winner from each division will be announced on Jan. 10. Former Blackhawks’ 2013 Stanley Cup winner Sheldon Brookbank was promoted Saturday from IceHogs assistant coach to Blackhawks assistant coach. Apparently, this was the plan all along, but the organization didn’t want to take two coaches from Rockford at the same time. Barry Smith will eventually transition back to his role as Director of Player Evaluation. This is another vote of confidence for head coach Jeremy Colliton. The organization appears to be granting all his requests in an effort to fully support him. Henri Jokiharju won the gold medal with Team Finland in the World Junior Championship. He tallied two power-play goals and two helpers in the tournament. The Blackhawks now await his return to the team. 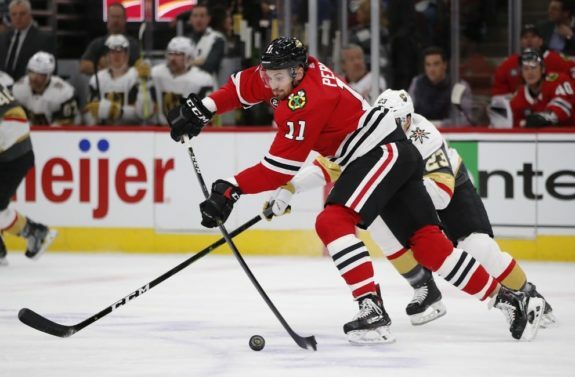 The Blackhawks get right back at it with the second half of back-to-back games Monday, when they take on the Calgary Flames at the United Center. They continue their mini-homestand by hosting the Nashville Predators Wednesday, and the Vegas Golden Knights Saturday. Can they continue to pick up steam as they go? Stay tuned.